As one of the fastest growing regions in the country, there is recognition that long-term transit planning efforts should be accelerated if we are to remain a leading, competitive region nationally and globally. 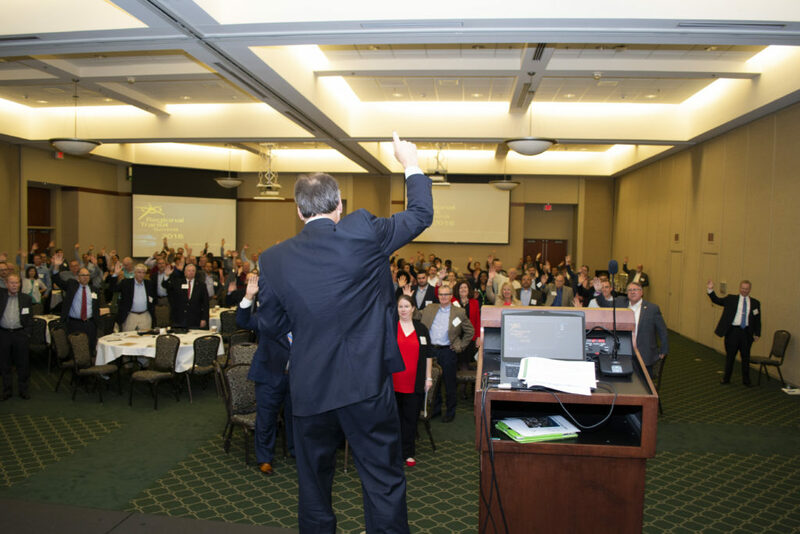 Transportation choice emerged as a top growth priority of CONNECT Our Future; a three-year, 14-county, bi-state planning process. A component of transportation choice, communities of all sizes – urban to rural, were eager to talk about regional transit in relation to transportation, economic access and mobility, economic development, and place making. The Regional Transit Public Engagement Series is a continuation of the CONNECT Our Future dialogue. It is an opportunity to have a focused conversation about regional transit, well before any planning takes place. This is a chance for communities to express their aspirations, concerns, values, and interests around long-term transit. By thinking through regional transit topics now and soliciting feedback from residents, we’ll be able to harness the best the future has to offer, while still preserving all of the things that make our communities great. The regional transit interest group meetings were intended to bring like-minded people and groups together from different communities to discuss and give input on our regional transit future. These meetings were held so that anyone could attend regardless of location or geography. Click here to see the November meeting schedule. The purpose of this phase of engagement was to build a scope of work for the Regional Transit Plan that reflects the needs of each county and to gain input on core transit messaging developed from our previous discussions. The audience for the October meetings included local government staff, local, state, and federal elected officials and staff, economic development staff, representatives from the private sector, and other transit stakeholders. After the October meetings, a series of stakeholder-focused meetings were held in the region in early November to gain feedback from groups representing interests in the economy, place making, and health sectors. Click here to see the October meeting schedule. Beginning in the spring of 2017 and continuing into the summer Centralina COG held a series of forums to gather input from local government staff and elected officials, and private sector and institutional leaders, on regional transit needs, values, concerns, and aspirations. 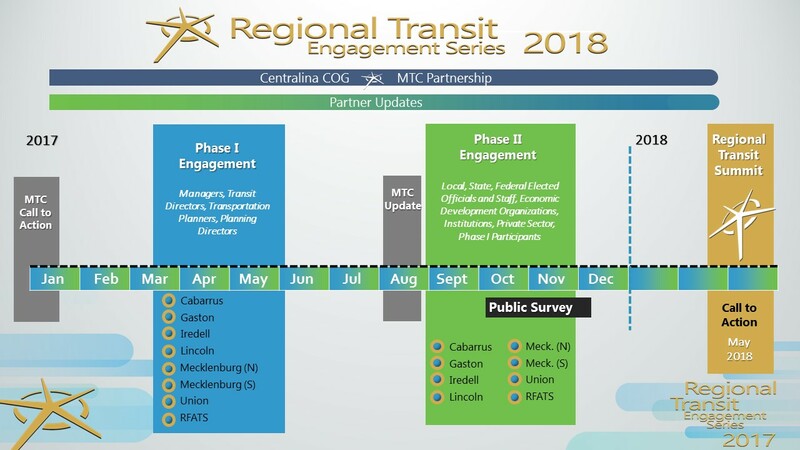 Engagement took place in the Metropolitan Transit Commission region of Mecklenburg, Iredell, Gaston, Lincoln, Cabarrus, and Union County, NC and portions of York and Lancaster County, SC. In addition, in late summer 2017 a public opinion survey was conducted to test general attitudes towards future transit. In the spring of 2018, we highlighted findings and consensus-based next steps during a regional transit summit. The Regional Transit Public Engagement Series will enhance the dialogue of community leaders and transit providers through increased understanding of the region’s desire for regional transit and key corridors and destinations. The project team met with town & county managers, transit directors, transportation planners, and planning directors in the study area. Workshops were held in March, April and May. Below are resources from these workshops. Phase I occurred during March – May 2017 and consisted of nine (9) county‐level meetings in Cabarrus, Gaston, Iredell, Lincoln, Mecklenburg (north and south) and Union counties, Rock Hill, South Carolina, and a make‐up meeting held at the Centralina COG for anyone unable to make their county’s meeting. Invitees included county and municipal managers, planning directors, planners, transportation planners, transportation directors, Metropolitan Planning Organization (MPO) and Rural Planning Organization (RPO) staff, Technical Coordinating Committee (TCC) members from CRTPO, GCLMPO, CRMPO, and RRRPO, Catawba Regional COG staff, CATS staff and Centralina COG staff. The purpose of the Phase I meetings was to provide a baseline of information on the region’s growth trends, the current state of transit planning, and to listen and gather input from local government staff and transit stakeholders from across the region. The meetings were designed to create dialogue and achieve clarity among regional stakeholders and to understand the transit related values, attitudes, concerns, and opportunities in each county. Full Report and Appendix are available below. Phase II occurred during August – October 2017 and consisted of ten (10) county-level meetings in Cabarrus, Gaston, Iredell, Lincoln, Mecklenburg (north and south) and Union counties, Rock Hill, South Carolina, and two make-up meetings held at the Centralina COG for anyone unable to make their county’s meeting. Invitees included local, state, and federal elected officials and their staff, economic development and private sector stakeholders, leaders of institutions, other community stakeholders, county and municipal managers, planning directors, planners, transportation planners, transportation directors, Metropolitan Planning Organization (MPO) and Rural Planning Organization (RPO) staff, Technical Coordinating Committee (TCC) members from CRTPO, GCLMPO, CRMPO, and RRRPO, Catawba Regional COG staff, CATS staff and Centralina COG staff. Please reference the following links for content distributed and discussed during the Summit. For more information on the Regional Transit Public Engagement Series, please contact Jason Wager at (704) 348-2707 or jwager@centralina.org.